Cool and dry in hot conditions, a previously unknown functional standard in the motorsport industry with the Aggressor Cool Base -1.0 from KLIM! 3 facts that make this underwear a “MUST HAVE” for every motorbike enthusiast! #1: The patented Coolcore ™ textiles work according to the cold evaporation principle and are fully functional on a long-term basis! The cooling effect starts as soon as you begin to sweat and the fabric absorbs the moisture from your body! 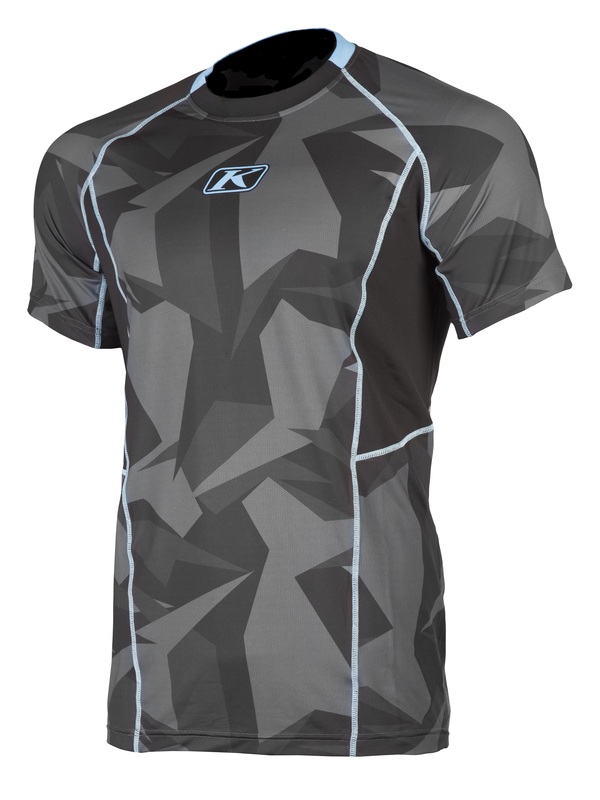 #2: Unlike other cooling fabrics, the KLIM Aggressor Cool -1.0 products do not function on a chemical or polymer crystal basis but on the physical principle of cooling by evaporation! The cooling effect is the same! Frequent use or washing does not impair the function – a highly durable product! #3: Aggressor Cool Base -1.0 is extremely breathable and dries quickly! In addition, the continuous four-way stretch material is comfortable to wear while the flatlock seams offer more freedom of movement! Thanks to the multi-part design, there are no irritating seams – thus ensuring optimal comfort! All in all: effective temperature regulation, comfort and freedom of movement, breathable, quick drying, comfortable to wear and the whole in a sporty cut and attractive camouflage pattern with contrasting seams! On top, there is also an Aggressor Cool -1.0 Neck Sock (RRP: €29)!